There are a lot of creatures that come to mind when people think of the Australian continent. The nation’s Outback is home to some of the most unique animals in the world, and none is more unique than the kangaroo. A native of Australia, the loveable marsupials are instantly recognizable around the globe as a symbol of the nation. The Royal Australian Mint celebrates its native resident on the 2013 1 oz Australian Kangaroo Road Sign Coins. While residents of North America are accustomed to road signs warning them of dangerous driving hazards caused by deer and other animals crossing the road, you will only see a road sign warning of kangaroos in Australia. 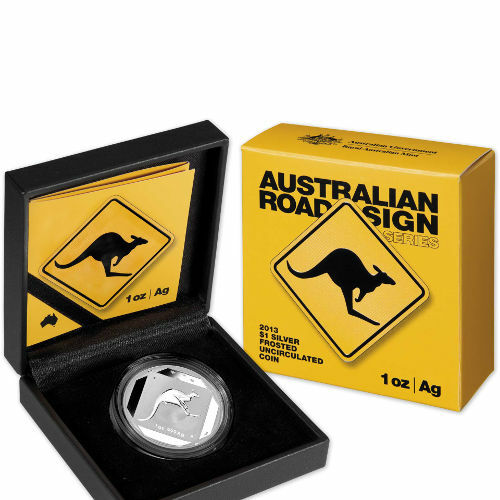 The Royal Australian Mint produces this unique coin, which features a hopping kangaroo on a diamond-shaped road sign. The frosted finish of the coins give the product a different look and feel than most silver bullion products. On the reverse side of the 2013 1 oz Australian Kangaroo Road Sign coin is the simple image of a road sign. On the sign, a hopping kangaroo serves as a warning to all drivers that kangaroos are in the area and caution needs to be exercised. The road sign itself has engravings for the weight, purity, and metal content of the coin. The obverse side of the coin features Ian Rank-Broadley’s right-profile portrait of Queen Elizabeth II. Unlike many other Australian, Canadian, and British coins with Her Majesty’s likeness, this coin displays the Queen inside an octagonal stop sign. 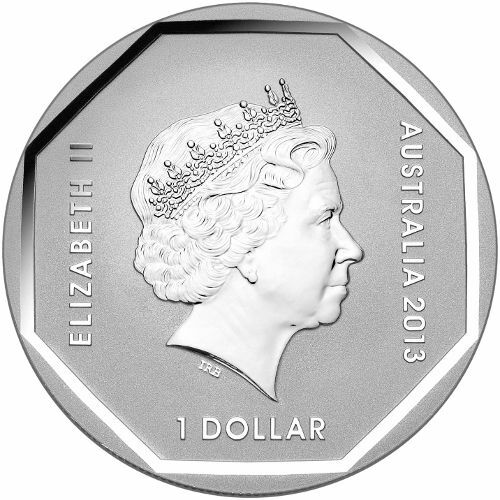 Engravings include “Elizabeth II,” “Australia 2013,” and the face value of the coin in Australian dollars (AUD). The Royal Australian Mint is the sovereign mint of the national government in Australia. The facility was opened in 1965 and took over duties as the official minting operation from the Perth Mint. While the latter remains as the only other mint in the nation, the Royal Australian Mint is responsible for striking circulation currency for the government. If you have any questions about this coin or the online purchasing process, feel free to call an associate at 888-989-7223. You can also connect with us online using the live chat feature located on our contact page.